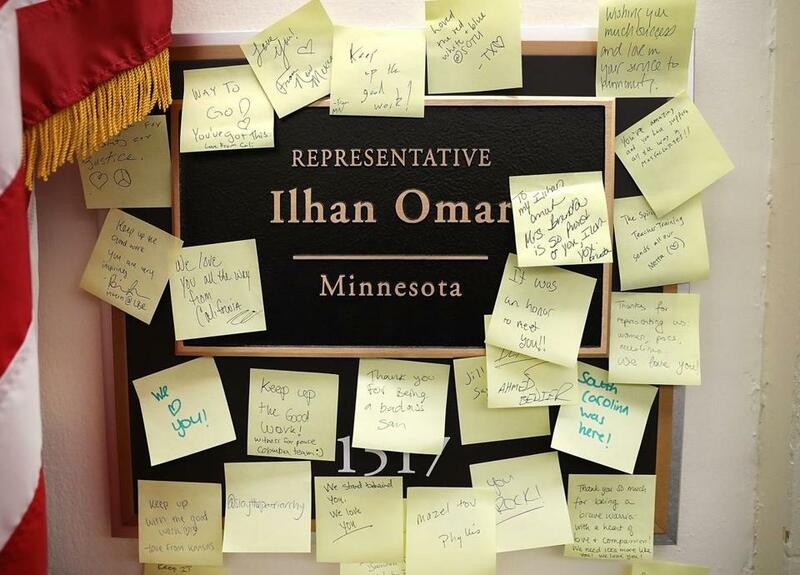 Notes of support were posted Monday on the name plate outside the office of US Representative Ilhan Omar, Democrat of Minnesota, in the Longworth House Office Building in Washington. 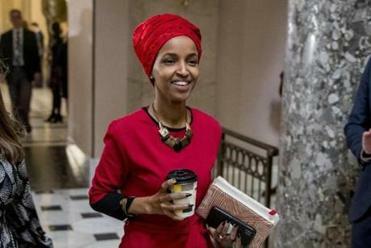 Omar has drawn rebuke from both sides of the aisle for what some say was an anti-Semitic tweet. WASHINGTON — US Representative Ilhan Omar, who has been battling charges of anti-Semitism for weeks, apologized Monday for insinuating that US support for Israel is fueled by money from a pro-Israel lobbying group — a comment that drew swift and unqualified condemnation from fellow Democrats on Monday, including House Speaker Nancy Pelosi. US Representative Ilhan Omar in the Capitol Building in Washington. She added, “I unequivocally apologize.” But she did not back away from her contention that the lobbying group, the American Israel Public Affairs Committee, has too much power in Washington. “At the same time, I reaffirm the problematic role of lobbyists in our politics, whether it be AIPAC, the NRA or the fossil fuel industry,” Omar wrote. The leadership statement came as concern crescendoed over Omar’s Twitter comment linking money from the AIPAC to political support in Washington for Israel. That raised the anti-Semitic trope of Jewish money holding inordinate power over foreign policy. But it came on top of earlier flashpoints that pitted Omar against Israel’s fiercest supporters in Congress, Republican and Democrat. The Twitter exchanges began when Omar responded to a tweet by journalist Glenn Greenwald. Greenwald had accused Representative Kevin McCarthy of California, the House Republican leader, of targeting Omar and another Democratic freshman, Representative Rashida Tlaib of Michigan, who has also been sharply critical of Israel. But it did not end there. A Jewish journalist asked whom Omar was referring to when she suggested that money was driving US policy regarding Israel. “AIPAC!” she replied. AIPAC does not contribute to political campaigns, but its large-scale conferences and congressional trips to Israel have long drawn enthusiastic and bipartisan participation. They have also elicited charges that AIPAC has deliberately fed a one-sided view of the Israel-Palestinian conflict into US politics. Tlaib, a Palestinian American, has been trying to organize her own congressional trip to the West Bank to give lawmakers the Palestinian side of the issue. Republican leaders quickly demanded that Omar be removed from the House Foreign Affairs Committee, just as Representative Steve King, Republican of Iowa, was stripped of his committee assignments after he made comments sympathetic to white supremacy. Omar had been trying to distance herself from a 2012 comment on Twitter in which she said Israel had been hypnotizing the world to look past its actions in the Gaza Strip. She expressed regret for trafficking in an anti-Semitic trope, which she said was unwitting. And she had reached out to Jewish Democrats to make amends.